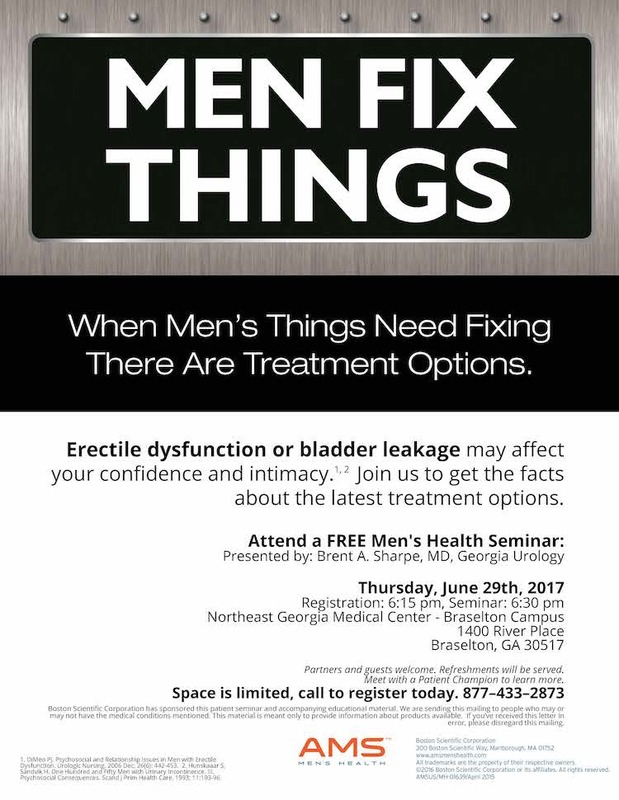 Georgia Urology’s Dr. Brent Sharpe will be partnering with the Boston Scientific Corporation to lead a free men’s health seminar. The seminar, which aims to boost the level of confidence and intimacy that men facing erectile dysfunction and bladder leakage may have, will be discussing the newest facts and treatment options surrounding these conditions. Northeast Georgia Medical Center on the Braselton Campus at 1400 River Place is hosting the event on Thursday, June 29th in Education Rooms one and two. The seminar begins at 6:30 p.m.; registration starts at 6:15 p.m. If you suffer from either erectile dysfunction or bladder leakage, the seminars are an informative way to learn the newest approaches in combating these issues. The seminar is free; however, space is limited. Make sure to call 877-433-2873 today to reserve your seat.